Geek Pride previously wrote about how some of the new Star Wars movies don’t measure up to the greatness of the original 70s to 80s trilogy. While Rogue One was without a doubt one of the most impressive additions to the franchise, other recent ones like The Force Awakens and The Last Jedi were mostly met with disappointing reviews. With the recent release of Solo: A Star Wars Story, however, it would seem that the beloved sci-fi franchise is turning a corner. To start with, the film has received the original Han Solo’s seal of approval. Comic Book reports that Solo star Alden Ehrenreich was approached by Harrison Ford himself during a press conference that featured the new movie’s cast and crew. With his signature maverick attitude and charisma, Ford surprised Ehrenreich with encouragement as well as positive reviews for Solo. Ehrenreich said that “It’s just such a huge deal to have him really genuinely enjoy the film.” And it looks like Ford is not alone in thinking that the new Solo delivers as promised. Game Spot reveals that a lot of the critics who have been to early screenings either loved or liked the movie. While the first act was deemed by some to be fairly slow and ‘hit-and-miss clunky’, Solo picks up nicely and delivers a great mix of action, drama, and comedy. Gizmodo’s Germain Lussier calls the movie “a non-stop adventure packed with way more emotion than you’re expecting.” The Nerdist also throws its two cents into the pot, saying that Solo is funny, filled with heart, and offers plenty of surprises which fans are going to love. Even those who found the movie underwhelming still confessed that they still liked it for what it is. It’s pleasantly surprising how Solo is getting such good feedback. Its many years in production were plagued with changing directors, casting concerns, and even untoward rumours about how the studio hired an acting coach to compensate for the star’s inability to channel the original Han Solo. In an interview with Esquire, former directors Chris Miller and Phil Lord addressed these rumours by explaining that the “coach” was actually writer-director Maggie Kiley, who was brought in as a consultant for the entire cast and crew. Final director Ron Howard also revealed that they weren’t looking for a play-by-play impersonation of Harrison Ford’s iconic portrayal of the character. Although Ford’s performance inevitably informed the film’s direction, Howard explained that “Han Solo’s character is sort of a vibe and a feel and a body language.” So, instead of just repeating Ford’s performance, they focused on expanding upon other possibilities with regards to the character. The fact that fans are still highly concerned about the portrayal of Han Solo is a testament to the character’s iconic influence. Despite the fact that Ford’s Solo first appeared onscreen over 40 years ago, both the character as well as the actor remain relevant to the modern zeitgeist. Two years ago, Carrie Fisher revealed that she got involved romantically with Ford when they were filming the first Star Wars movie. While news of the affair spurred lots of discussion, it was hardly surprising as Ford is known for his charm both off and onscreen – a characteristic that has come to define the Han Solo that we all know and love. 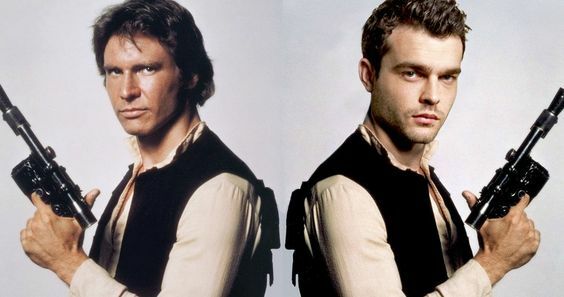 And whether or not you agree that Alden Ehrenreich lived up to the original Han Solo, it cannot be dismissed that the young star also added new personality aspects to the character. It appears it worked well, considering the praise the film has been getting so far. Ehrenreich’s version of Han Solo is here to stay, and in fact, two more Solo movies are already in the works. What did you think of Solo: A Star Wars Story? Did it live up to the hype?